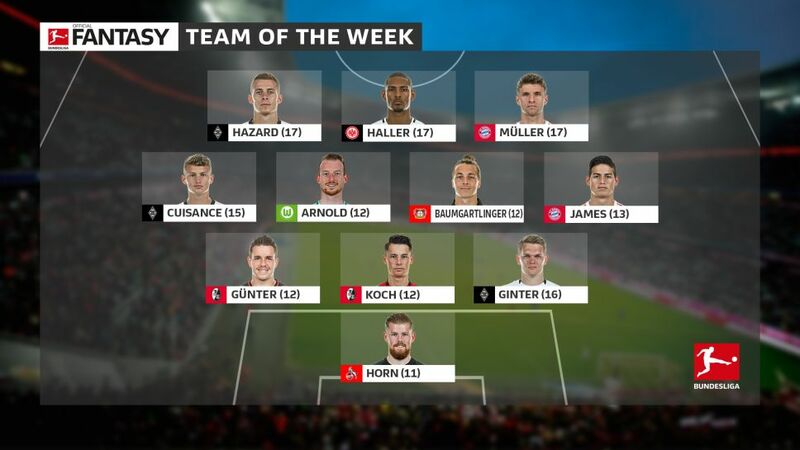 Bayern Munich duo Thomas Müller and James Rodriguez secured their place in the Official Fantasy Bundesliga Team of the Week after helping the league leaders beat Werder Bremen on Sunday, but who else features in Matchday 19’s all-star XI? The Billy Goats’ custodian helped his side to a fourth clean sheet of the season in the crucial 2-0 victory over fellow strugglers Hamburg at the Volksparkstadion, earning five bonus points for the shutout and another three for the saves he pulled off against the Red Shorts. If he can maintain this type of form, a call-up to Joachim Löw’s 2018 FIFA World Cup squad might not be beyond the realms of possibility. A goal, an assist and a clean sheet - Ginter could hardly have wished for a better afternoon against Augsburg at the BORUSSIA-Park! The centre-back put the Foals in front with a bullet header after just ten minutes before setting up Thorgan Hazard to seal the win in second-half stoppage time. Herr Löw will have taken note. Freiburg’s impressive 2-1 victory over high-flying RB Leipzig did not come as a huge surprise, given the Black Forest club’s impressive form, but few would have expected Koch to grab his second goal in as many games at the Schwarzwald-Stadion! The 21-year-old didn’t shirk his defensive duties, though, winning seven challenges and covering more ground (12.39 kilometres) than any other player. Koch had defensive colleague Günter to thank for assisting his winning goal on Saturday. The Leipzig defence failed to deal with the Freiburg left-back’s teasing cross from a corner in the 76th minute, allowing Koch to nod home the home side’s second of the game. Günter also won six of his challenges against Ralph Hasenhüttl’s troops, earning him an extra three points to go with his assist bonus. Watch: James hails Bayern’s "world-class players"
Leon Bailey may have grabbed the headlines against Hoffenheim with his audacious back-heeled effort, but Baumgartlinger’s role in Saturday’s impressive 4-1 victory at the WIRSOL Rhein-Neckar-Arena was just as crucial. As well as netting Bayer’s second goal in Sinsheim, the Austria international also earned himself an extra four points by winning 12 of his attempted duels. It proved to be an unhappy afternoon for Arnold as the Wolves slipped to a 3-1 defeat at home to Eintracht Frankfurt, but the midfielder’s second-half free-kick - an unstoppable drive into the top left-hand corner from the edge of the penalty area - was a thing of beauty. Arnold also won more challenges (16) than anyone else on the pitch, but his heroic efforts weren’t enough to prevent the Eagles from leaving the Volkswagen Arena with all three points. The young Frenchman covered every blade of grass in Gladbach’s win over Augsburg on Saturday. Indeed, only Hazard matched the 21-year-old midfielder’s 11.87 kilometres at the BORUSSIA-Park, while the Strasbourg-native also won more challenges (23) than any other player on the pitch. Müller’s brace at the Allianz Arena on Sunday not only helped Bayern come from behind to defeat Bremen, it also lifted the 28-year-old onto 100 Bundesliga goals! The Germany international is one of several players who have blossomed since Jupp Heynckes’ return to Munich, scoring four goals and assisting a further five in eight league appearances since the 72-year-old replaced Carlo Ancelotti in October. Haller’s opener against Wolfsburg might not have been quite as spectacular as his Goal of the Year-winning scissor-kick against Stuttgart, but the Frenchman’s fierce drive into the roof of Koen Casteels’ net was still mightily impressive. As well as setting up Luka Jovic for the Eagles’ third, the Frenchman also won 14 of his attempted duels - only Arnold and Omar Mascarell enjoyed a higher success rate. The Belgian’s prolific form shows no sign of letting up in 2018! After delivering the cross that led to Ginter’s early opener against Augsburg, the 24-year-old capped a fine Borussia win with a superb break-away goal in the 90th minute. Hazard has now played a direct role in nearly half of Gladbach’s 30 league goals this season (seven goals, seven assists).